Soil amendments improve the physical structure and properties of soils. You mix amendments, with a shovel or a rototiller, into the soil thoroughly to provide a better environment for plant roots to receive soil nutrients and oxygen, and for better drainage. A lot of different types of soil amendments are available. The best amendments are the ones you make yourself. The next best choice is to buy organic amendments versus inorganic amendments when you have a choice. You can find a lot of good commercial organic soil amendments on the market today. Try those that are recommended by your favorite nursery or home improvement store, and make sure you know what’s in them. Inorganic soil amendments are usually man-made amendments, such as chemical nitrogen fertilizers. Organic soil amendments come from living sources — or they once were living sources. Examples include compost, manures (chicken, rabbit, sheep, horse, steer, cow, pig), gypsum, seaweed extract, alfalfa meal, organic cottonseed meal, bone meal, blood meal, worm castings, and fishmeal. Organic soil amendments are the better choice, if you intend to free-range your chickens. Soil amendment pros and cons: Organic amendments renew the soil and continue to make soil balanced and better. Composting is the best source of organic matter, something you can make yourself, and it’s free. Some organic soil amendments can be quite smelly and can tempt family pets to roll and dig for enjoyment. Sometimes commercial-made amendments have questionable ingredients and quality. By composting, you’re practicing proper manure management, controlling flies, creating a dark nutrient-rich humus material, and returning it back into your soil. Chickens love the compost pile. They can help turn it for you and benefit the aeration process. 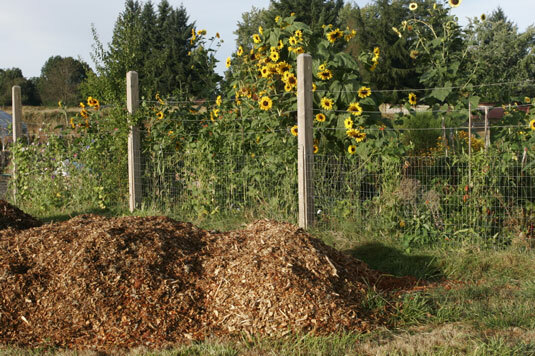 Simply give them ground access to the compost pile by removing the stacks, pallets, or wiring, and so forth that your compost is contained in. Perhaps you have one large informal mound of compost, create two piles and allow your chickens access to these piles to mix, turnover, and aerate the pile. When you add chicken manure to a compost pile on a daily basis, it’s considered a green ingredient. Fresh chicken manure is considered hot manure, and it needs at least two months to compost and cure before you mix large amounts into your soil, plants, and flowerbeds. Compost pros and cons: You have everything to gain by composting — from dramatically increasing the health of your soil and saving you money to practicing sustainability and effectively managing your chicken manure. If there are any cons, they include having the discipline to compost regularly, and having the brute strength to turn over your compost pile periodically, wheelbarrow it around your garden, and finally mixing it into the soil. Mulch is another valuable softscape element that adds tremendous value to your garden landscape. You place mulch on the soil surface instead of mixing it into the soil. Different types of mulch can vary in different regions, depending on what’s readily available. Mulching around plant material helps control weeds, reduces water requirements, adds nutrients, and protects plants from extreme hot and cool conditions. Mulch is available in many material forms. 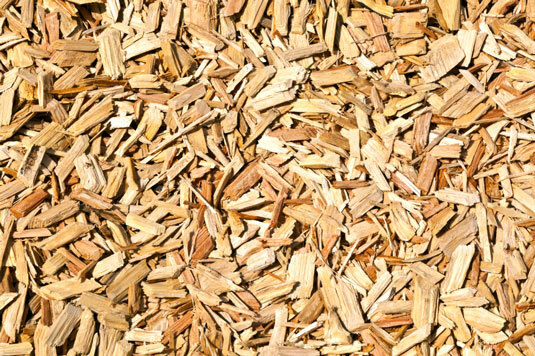 Examples of mulch are compost, straw, topsoil dressing, pine needles, fallen leaves, and chipped trees used in walking bark. Consider what you have in your landscape naturally — it may make a good mulch material. Chickens love mulch, especially mulch that has been recently added to plants or in flowerbed areas. They scratch around the plants, looking for bugs. As soon as you mulch an area of your garden, your chickens will be immediately attracted to that area. Protect your plants ahead of time, either by surrounding them with chicken wire, placing stone at their base, or fencing your chickens away. Mulch pros and cons: You can buy mulch by the yard, and load it in a pickup truck, or have it custom delivered to your driveway. 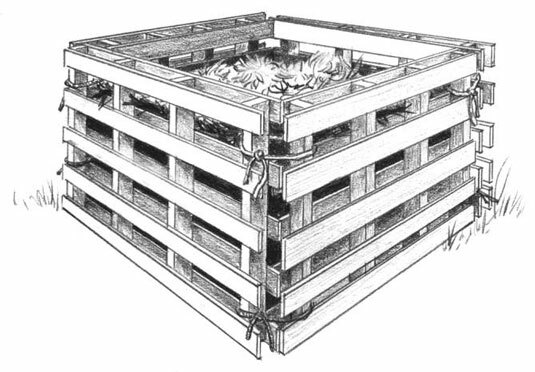 A standard truck bed holds a yard of mulch, which is equal to about 9 full wheelbarrows. Mulch can be purchased by the bag for smaller garden areas. Mulch can be spread over a desired garden area in a depth usually of 2″-3″. Sometimes this expense adds up. Mulch involves some labor on your part, or hiring someone to spread it around. Walking bark is a good softscape material that can be considered a hardscape or softscape material depending on how you use it in your landscape. As a hardscape material it can easily be used for heavy traffic areas for pathways and entertaining areas. It can help fill in garden areas that are low and tend to stay damp. As a softscape material, it’s a heavy-duty mulch around plants and flowerbeds. It’s cheap and may even be free, if you know the right landscape professional. Usually it’s made up of chipped tree and landscape trimmings. The texture is coarse, and it’s very chicken-friendly. Walking bark pros and cons: Walking bark is usually inexpensive to purchase. Walking bark creates an instant woodlands style. Walking bark can last for years, but it looks best when replenished on a regular basis. Chickens love to scratch walking bark, and they can make a mess of it. Walking bark areas can be slippery when wet.